Ivan Šimko holds a PhD in Philosophy from the University of Vienna (2014). 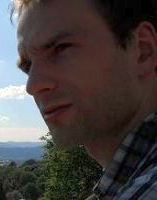 He has been a student in Bulgarian Philology at the University of Vienna (since 2011). He was born in 1985 in former Czechoslovakia. Ivan Šimko specializes in cross-cultural relations and diachronic linguistics. He has participated in the project "The Text Levski - Readings in Domestic and Foreign Contexts" (2013). In his free time he likes fencing and gardening, but most of his time he spends with the books and at the computer.